2020 Polaris 850 PRO-RMK 174 SC 3 in. The SnowCheck-Exclusive 850 PRO-RMK® 174 - powered by the all-new Polaris® 850 Patriot™ engine - offers the best power-to-weight ratio. AXYS® CHASSIS: The raised AXYS® increases clearance and reduces drag to keep you on top of the snow. 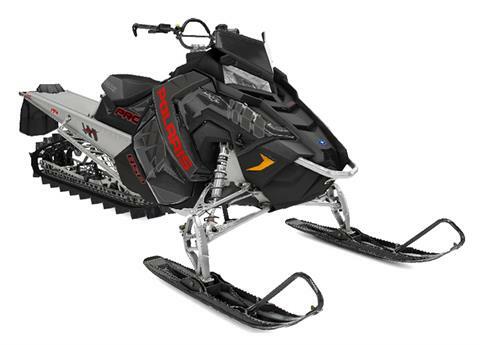 It is purpose-built for mountain riding and allows for improved sidehilling, faster and easier climbing, and instantaneous lift allowing the sled to pop onto the snow faster. The aluminum over structure is lightweight and durable for all types of riding. WALKER EVANS® SHOCKS: The PRO-RMK® 174 comes with premium Walker Evans® Piggyback Shocks or Monotube Shocks. The Walker Evans® Piggyback Shocks with compression adjusters and remote reservoirs offer the best performance across the broadest range of conditions. The Walker Evans® Monotube Impact-Extruded Shocks are the lightest weight shock option from Polaris® for those riders counting the ounces. The one-piece, simple design is lightweight yet durable. CHAINCASE DRIVE SYSTEM: The PRO-RMK® 174 with 3" Series 7 track uses the Polaris® tried and true chaincase drive system, which has 12% lower gear ratio necessary to deliver the optimal performance for the 3" track. 15 X 174 X 3.0" SERIES 7 TRACK: The Polaris®-exclusive Series 7 3.0" Track is the ideal track to provide lift in the deepest, softest snow conditions. Features a lightweight single-ply design optimized for weight and powder snow performance.